What do kids like to do on a snowy winter day? Yes! Build a snowman! Meet Dan, a fun-seeking boy and his lovable snowman, Paul who enjoys playing with his young new friend. Dan and Snowman Paul will transport you and your children to imaginary worlds where magic happens and impossible dreams come true. 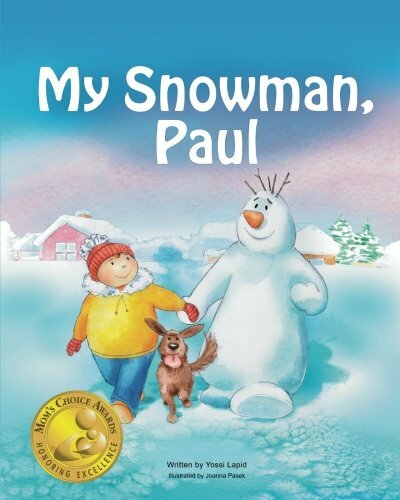 My Snowman Paul, is the first volume in an award-winning children’s picture book series. It tells the story of how Dan and Paul first meet and become best friends. The story encourages us to listen to the little voice inside us and not to worry too much about what others might think about our whims and dreams. Fast paced and stunningly illustrated by Joanna Pasek, this rhyming picture book series carries great messages for kids – don’t cheat, apologize when you do wrong, make up for your mistakes, don’t allow bullies to intimidate you, love nature, be respectful of others and, above all, pursue your dreams and don’t be easily discouraged. The lessons embedded in Snowman Paul’s adventures can be enjoyed by any age, but preschool and kindergarten children will especially love them. They are perfect for both cold winter days and warm summer times. They are great bedtime stories and ideal for beginner readers. They make beautiful gifts and they will show you how much fun winters can be if you let loose your imagination. Want to experience great winter time fun? Join Dan and Snowman Paul in their imaginative and whimsical adventures.